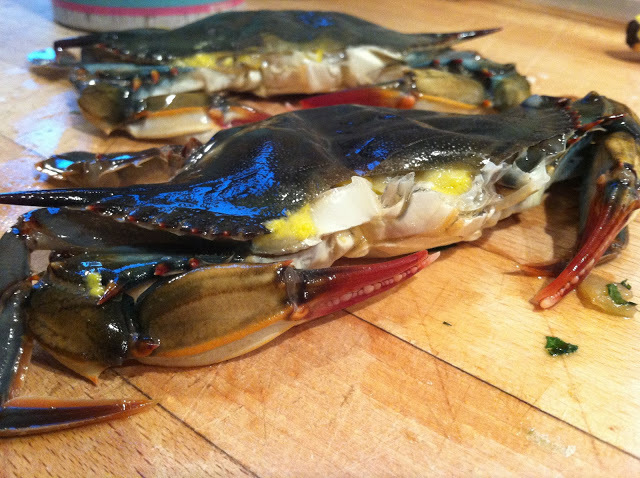 Soft-shell crabs, soft-shell crabs, soft-shell crabs! I’ve been praising these magical creatures with my fork since I was a little girl – we had uncanny palates for kids on account of my mom’s Italian ways. I remember going to Sono Seafood and ordering the soft-shell crab sandwich – perfectly fried and wedged between a roll with lavish dollops of tartare sauce. Mouth … watering … at the memory! Though seemingly lavish, soft-shell crabs are about the easiest peasiest summer solution for dinner. 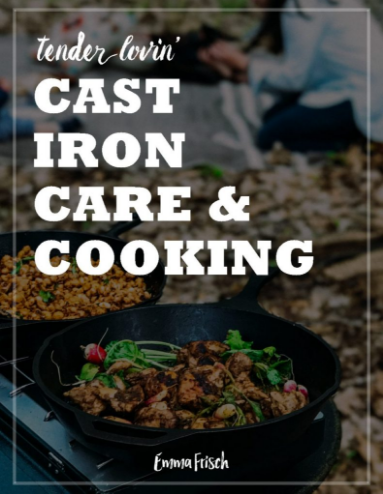 They require very little cooking if you want things to be as breezy as the ocean air. They come packed with flavor and fervor. If you haven’t tried one before, I’d recommend it. 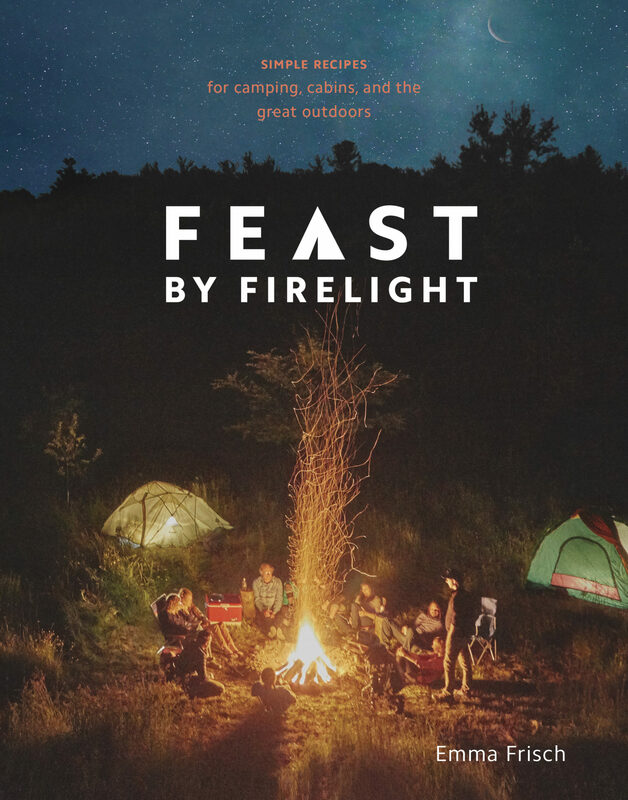 They are light and leave you feeling less gluttonous than a lobster dish. 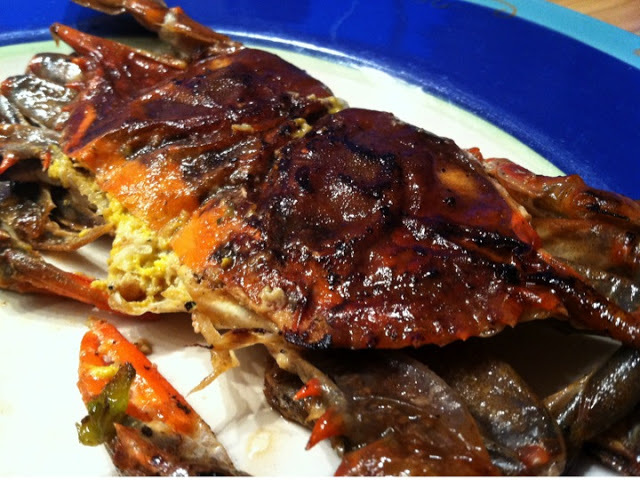 Soft-shell crabs have shed their exoskeleton, the hard shell you fight through to the meat. Nearly the whole crab is edible, save for the gills and the mouthparts, but I find myself eating nearly everything soft enough to chew. You can plunk the whole thing in a deep fryer and devour. I like mine more tender and light – just a pad of butter to saute them right. Believe it or not, my stepdad taught me this recipe! He’s a thoroughly meat n’ potatoes Brit with an affection for booze (did I mention Brit?). He doesn’t always have the patience for mamma and my culinary adventures, which sometimes transpire well past our bellies have rumbled for attention. So he scooped these crabbies up from Sono Seafood and got them sizzling immediately, inviting me to come up with an equally quick side pairing. 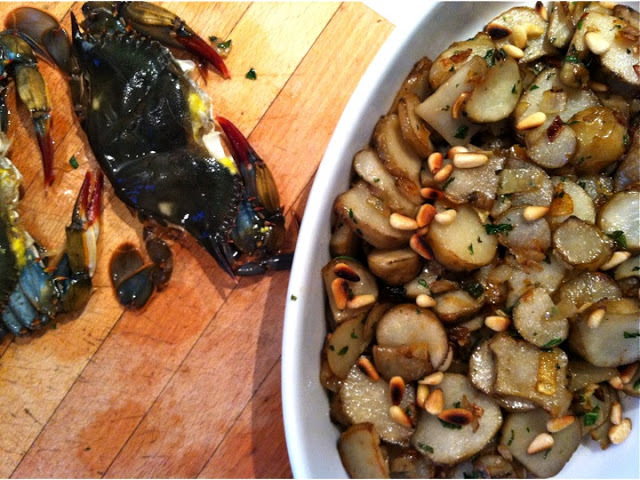 Instead of lobster and potatoes, we’re pairing these soft-shell crabs with sunchokes, an early summer treasure. The inspiration for this recipe came from my dear friend, and globe-trotting mate, Emily. 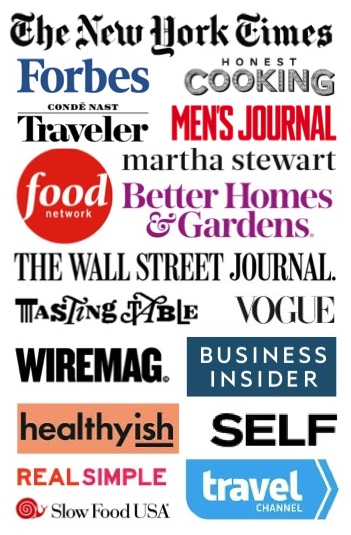 She’s my #1 blog fan, and often asks me for cooking suggestions and tips, but she’s constantly inspiring me too! As an Ottawa resident with a short harvest season, she gobbles up every fresh vegetable that comes through her farmers market. The other day she mentioned her resolution to get more creative in the kitchen, starting with a sunchoke dish she dazzled up with olive oil and mint. I couldn’t get those tantalizing flavors out of my mind. I descended on Early Morning Farm at the Ithaca Farmers Market, raking up a few pounds of sunchokes to give it my own spin! 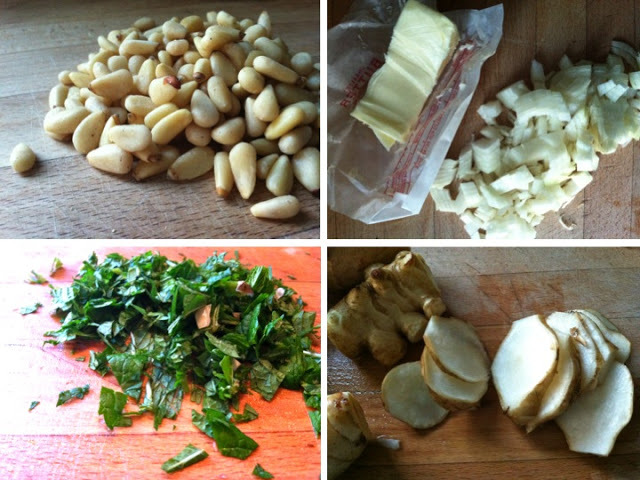 Sunchokes (a.k.a. 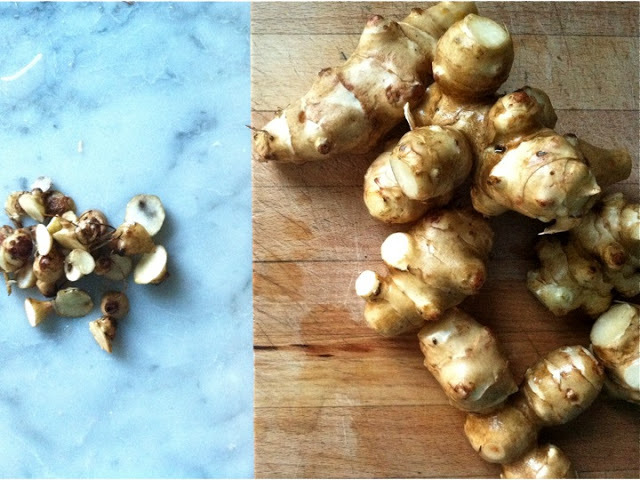 Jerusalem Artichokes) resemble ginger root, though slightly plumper. (They are nutritious to boot, but have been known to have the same effect as beans – good for your heart, but …) Anyhoo, I really wouldn’t let this stop you from savoring them in season. 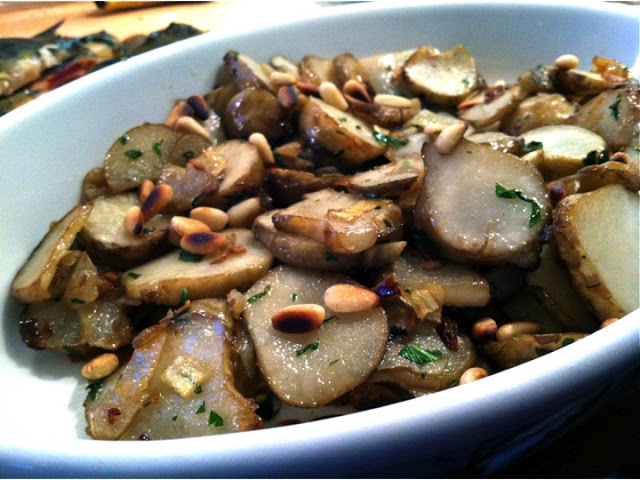 Sunchokes are delightful served raw in salads (like water chestnuts), or added to sautes, stir fry, stews and more. They retain more water than potatoes, and therefore like to be stored in a plastic bag in the refrigerator to prevent them from drying out. Stored this way, they last up to several weeks, and happily survived the car ride to Mamma’s seaside farmlette in South Norwalk, CT. This is where I found the mint for my recipe, growing rampant and begging to be used (though there is always something calling to me from her teaming garden). It’s summer, and the time is now to whip up this meal for company! 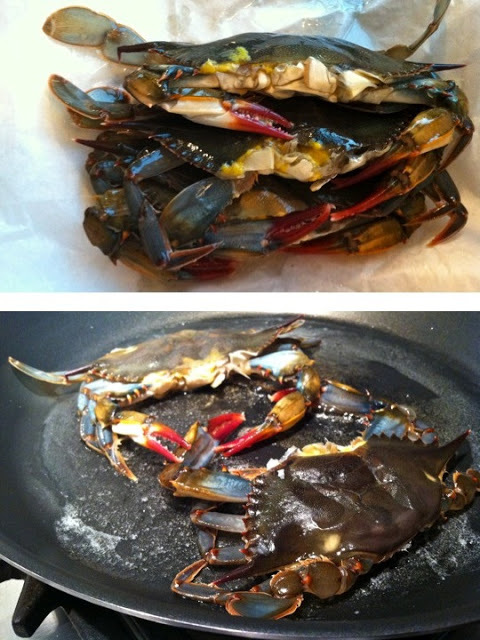 Try to find crabs that are fresh, fresh, fresh - alive! If you live near the sea, visit a fish market near the docks (like Sono Seaport Seafood). If land-locked, check in with the fishmonger at the grocery store for quality and freshness. The best place to find sunchokes is at the farmers market. But many grocery stores also carry them at this time of year! You can cut off any gnarly ends, but don't bother peeling the skin - just scrub well and rinse the dirt from the elbows of the sunchokes. There are all sorts of nutrients and earthy, nutty flavors in the skin. You can substitute the pine nuts (which are often absurdly expensive) with almonds, walnuts or any other nut - get creative and colorful with pistachios! In a large frying pan melt the butter over medium-high. When the butter is just about melted add the crabs stomach-side down. Let them pop and sizzle for a good 5-7 minutes, or until the bottom is seared brown. Peek by lifting with a spatula. Flip and repeat on the other side. They should turn a beautiful, charred brick red. Serve with a generous spritz of lemon! In a large frying pan, melt the butter over medium heat. Add the onions and stir to mix with the butter. Cover with a lid and caramelize the onions for about 10 minutes. Add the salt and sunchokes, and toss with the onions. Saute for about 10 minutes, stirring occasionally. Let them stick to the pan and get browned! 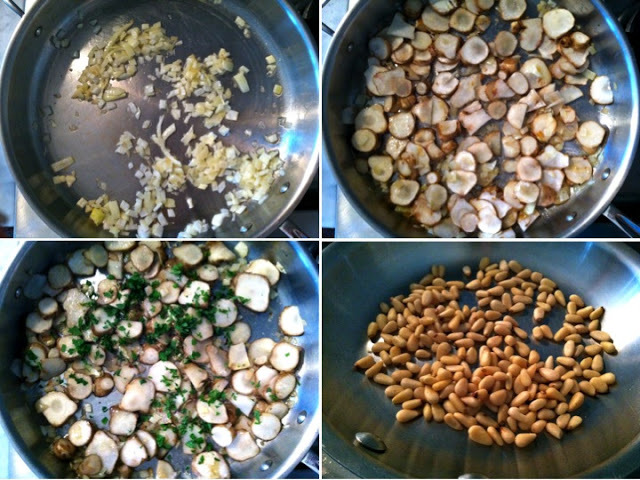 Remove the sunchokes from the pan and toss with the mint and pine nuts. Dress with freshly ground black pepper and a drizzle of fresh lemon juice.